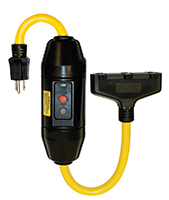 Tower Manufacturing’s Inline GFCI’s offer OSHA required electrical safety for use with temporary electrical power. 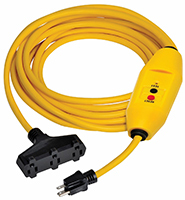 Tower’s Inline GFCI’s are available in 15 and 20 Amp, with single and triple tap configurations and use 12/3 AWG Cord. 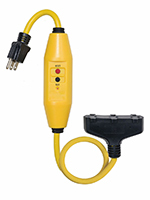 Towers Inline GFCI’s are ideal for use in construction, industrial maintenance and remodeling/demolition and come in a variety of cord lengths starting from less than 18″ to 100 ft. with choice of 1 or 3 outlets. Tower offers models in both Automatic and Manual Reset. An automatic reset turns on upon being plugged in or after a power interruption. A manual reset requires the user to press the reset button after initial plug-in or after a power failure. Both automatic and manual reset GFCI types must be manually reset after a ground fault occurrence. 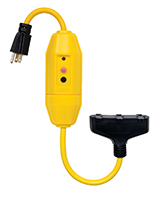 Inline GFCI, Lighted Triple Tap, 2 ft.